Two steps forward, one step back. For working parents in America, progress toward family-friendly workplaces seems frustratingly slow. And when a well-funded nonprofit foundation pulls back on benefits, it’s an unpleasant precedent. According to KUOW reporter David Hyde, the Bill and Melinda Gates Foundation is cutting parental leave from one year of paid leave to six months due to the disruption in work caused by staff members who utilized the program. The Foundation expanded paid parental leave from 16 weeks to one year in 2015 at which time it highlighted its commitment to healthier kids and strong and resilient families. The Gates Foundation was part of a recent movement among high-profile companies and nonprofits to offer employees substantial benefits, including Netflix’s one-year family paid leave and unlimited vacation time policies. It’s now widely established that the state of family leave in the United States is appalling: The last significant piece of legislation supporting families, the Family and Medical Leave Act (FMLA), was passed 25 years ago and only mandates a minimum of 12 weeks unpaid, job-protected leave to employees. And, a 2017 study by the Urban Institute found that 40 percent of American employees aren’t even covered by FMLA—indeed, a large percentage of the country’s nonprofit workforce is employed by organizations with fewer than 50 employees. 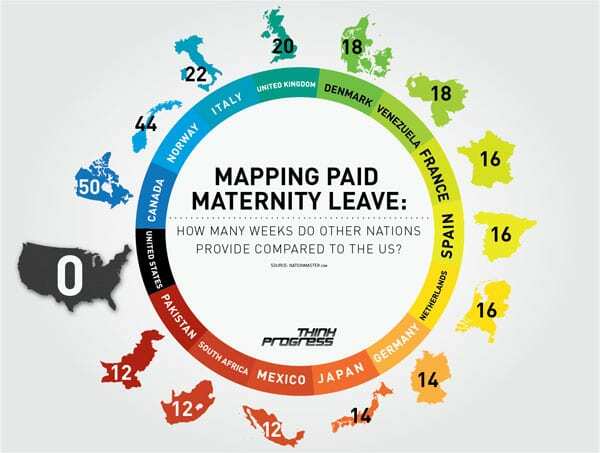 Today, the US is one of only two countries without a national paid leave policy and workers with less education and lower wages have less access to paid leave, according to the study. Many new mothers find it ironic that the FMLA only guarantees 12 weeks off while the American Academy of Pediatrics recommends exclusively breastfeeding infants for six months—especially because break time for nursing mothers at work wasn’t legally required until the Affordable Care Act was signed into law in 2010. The tide has been turning, at least among the public, Urban Institute researchers Julia Isaacs, Olivia Healy, and H. Elizabeth Peters write, “Polls suggest that both Democrat (88 percent) and Republican (71 percent) voters are in favor of ‘requiring employers to offer paid leave to parents of new children and employees caring for sick family members.’” Paid leave may improve health and developmental outcomes for families and, in turn, communities and employers can benefit from greater employee satisfaction and reduced turnover, the Urban Institute notes. Some individual states have taken up the mandate to support additional worker rights, but the National Conference of State Legislatures reports that only four states had instigated paid family and medical leave as of 2018, funded through employee-paid payroll taxes. In New Hampshire, one female state representative spent nearly two decades sponsoring bills to introduce a system of paid family leave to the state, only to see her final bill die last year under the threat of a veto from the governor. In California, newly elected Governor Gavin Newsom has pledged to increase that state’s paid medical leave from six weeks to six months (which could go to one parent and be shared by both parents). But, a lack of long-term foresight and investment by funding these programs in most states and on the national level isn’t the only challenge to implementation. The Gates Foundation’s announcement illustrates the need to create an infrastructure to support employers and employees moving to a new workplace paradigm. Managers also told us some common challenges were magnified by the leave duration. They noted the difficulty of identifying and onboarding backfill talent, facilitating a sufficient transfer of knowledge, and re-onboarding returning employees, especially if teams, business goals, or individual roles changed during a year away. First, let’s acknowledge that perhaps the Foundation should have used its global perspective to find out how other countries support one and two-year parental absences and figured out onboarding and re-entry best practices before adding a benefit that was quickly retracted. However, Rice’s experience speaks to a potential lack of experienced, temporary workers who will be needed to fill positions as family leave policies expand. Could the surge of retiring baby boomers or experience-hungry young people be mobilized to fill this void? As nonprofits work to create greater equity in local communities and mirror those values internally by nurturing human capital, this is a piece of the puzzle that can’t be ignored. There should be much more support for nonprofits and other employers looking to do the right thing for employers but not sure how to make it all work. Hyde’s story also notes that the Gates Foundation is underwriting its policy change with a commitment to support parents returning to work after a six-month leave with a $20,000 stipend to defray childcare costs. According to Child Care Aware of Washington, the median cost per month for infant care at a child-care center is $1,499. But, again, the Gates Foundation’s stopgap solution fails to recognize that the country’s childcare system is also failing; as NPQ recently reported, there is a workforce crisis in early childhood education, where the median annual pay for childcare workers was $22,290 in 2017 and the number of workers is declining. In King County, which the Gates Foundation calls home, child-care providers had capacity last year for only half of all county children under age 5, according to the Seattle Times. Reflecting an all-too-common pattern, a major nonprofit institution, New York City’s Museum of Modern Art, has raised hundreds of millions for new buildings, but seeks to trim staff benefits.